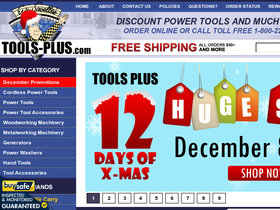 Visit Tools Plus online at Tools-Plus.com which is committed to carrying the largest selection of Tools and Accessories from the largest selection of top manufacturers. Whether you're shopping for the hottest new cordless tool or the most time tested piece of woodworking machinery or power tools, Tools Plus is there to get you what you need at the lowest price possible. Save on your next purchase from Tools-Plus.com with Tools Plus discounts, Tools Plus coupons, Tools Plus promotions and Tools Plus savings from 58coupons.com. Save up to $75 with rebates on select items from Tools-Plus.com. Click link and go to Rebates and Bonuses for complete selection. Enter this coupon code at checkout for free shipping when you purchase at least one Festool item. Get a free t-shirt from Tools-Plus and Hitachi when you type "free hitachi shirt" in the comments box while placing your order. Click link to get started. Get yourself a Free Makita Accessory from Tools-Plus.com with a select Makita purchase. Click link for details. Get all your Tools shipped for one low price. Flat Rate Shipping from Tools-Plus.com is just $6.50. Tools Plus is having a 15% off sale on select tools. Click link to view.